Washington – President Bush said he was “very disappointed” to learn that he will likely not be receiving any of the $3,000 security deposit he put down when he took over the White House in January of 2001. Mr. Bush said he had not expected to have the entire amount of the deposit returned, but was shocked to learn he would likely be receiving nothing at all. 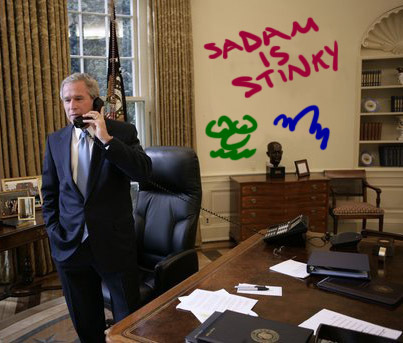 Charles Lee, a spokesman for Anyuan Real Estate, the Chinese company which now owns the White House and leases it to the U.S. government, said the company could not return Mr. Bush’s deposit due in part to crayon drawings on several of the walls, most notably in the Oval Office. Sources say Mr. Bush would have received at least a portion of the $3,000, perhaps as much as $1,500, until an inspection last week revealed wads of bubble gum underneath nearly every desk in the White House.